Lightning is a powerful electrical discharge made during a thunderstorm. The electric current makes the air very hot. The suddenly heated air expands very quickly, which causes thunder. Sometimes lightning happens between clouds. Sometimes (in the rain) lighting goes from cloud to ground. If it goes from cloud to ground, it can strike a person. Around 2000 people are struck by lightning each year. About 50 to 100 lightning bolts strike the Earth every second. Lightning has hit the Empire State Building as many as 500 times a year. Lightning usually hits the tallest structure. When lightning strikes, the surface rubs electrons from the lightning, and a spark of electricity shoots from the lightning to the surface. In a thunderstorm, the lower cloud has as many as 100 million volts of electricity. This electricity is given out either within the cloud, to the ground, to another cloud, or into the air. 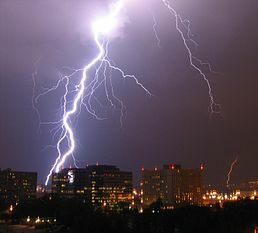 Lightning has been known to travel from the ground upwards to the cloud. In 1993, scientists discovered lightning bolts that shot upward from the top of a cumulonimbus cloud. People can make and study lightning with a Tesla coil or a Van de Graaff Generator. ↑ 1.0 1.1 1.2 1.3 Oard, Michael (1997). The Weather Book. P.O. Box 126, Green Forest, AR 72638: Master Books. ISBN 0-89051-211-6. This page was last changed on 4 December 2018, at 02:36.